Nintendo just dumped a list of games coming to the 3DS' eShop through the rest of the year and slightly beyond. Some of these games were expected but there are a lot of surprises. The surprises include a sequel to the well-regarded 2011 eShop game Pushmo and three of four games made by Japanese all-star developers (Suda 51 (No More Heroes, Killer 7), Yoot Saito (Sim Tower, Seaman), and Yasumi Matsuno did Final Fantasy Tactics and Vagrant Story)) for hit Japanese studio Level 5. All that and Zelda II, too. Crashmo launches Nov. 22. Players can embrace the laws of gravity and challenge themselves with a whole new kind of action-puzzle play in this exciting sequel to the critically acclaimed Pushmo. New gravity mechanics and gadgets like floating blocks, doors and move switches await, testing players' skills as they push, pull and slide each puzzle's colorful blocks in order to climb to the top. Just be careful where those blocks are moved-unsupported blocks will come crashing down. Crashmo contains lots of puzzles to test your brains, and enhanced puzzle-creation and -sharing features mean that even when all the puzzles are cleared, the fun never has to stop. Three original games from LEVEL-5 and several well-known Japanese collaborators will launch in the Nintendo eShop for Nintendo 3DS before this holiday season. The first of these games, SUDA 51's LIBERATION MAIDEN, is set 100 years in the future, when the president of Japan boards her Liberator, Kamui, and fights to free her country one region at a time. AERO PORTER by Yoot Saito and Yasumi Matsuno's CRIMSON SHROUD are also slated for release by the end of the year. Two demo versions of Style Savvy: Trendsetters will be available for download from the Nintendo eShop. The first demo is available today and lets players participate in a fashion contest, create an outfit based on the contest theme, style their model's hair and makeup and send her down the runway. The second demo will be available on Nov. 1, and lets players style their clothes and makeup, and then connect to the Internet via Nintendo Network to visit the online Fashion Plaza where they can check out ensembles that actual Style Savvy: Trendsetters players have created. Any items purchased using in-game currency in this demo version can be transferred to the full game. Style Savvy: Trendsetters will launch in stores and in the Nintendo eShop on Oct. 22. There are some very good old ones and some promising new ones. Looks like Nintendo's downloadable gaming strategy is getting ever stronger. It should be noted that America does still seem to be a cycle behind on eShop releases. While Crashmo and the new Fluidity haven't been released yet, Level 5's games have in Japan. New Japanese releases for the eShop include the likes of Pokemon studio Game Freak's HarmoKnight, which have not been announced for an American release. 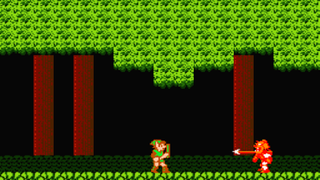 Top Zelda II screenshot via Sydlexia.